Ever wanted to find something fun, exciting and interactive to do with friends and family whilst bouncing on the trampoline? 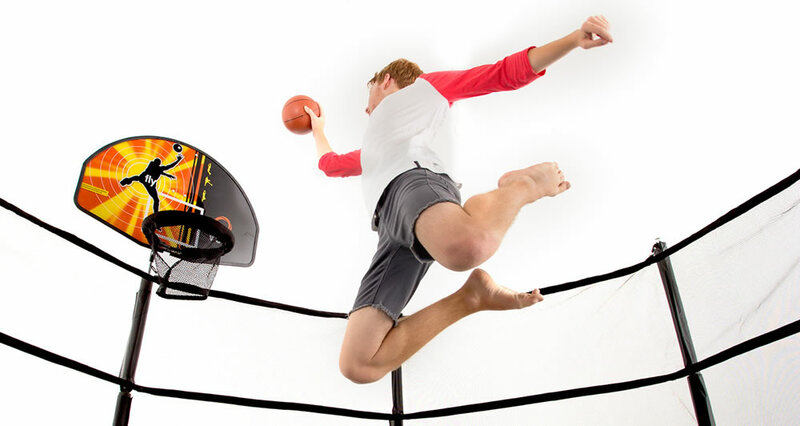 Well why not try Vuly's very new trampoline product, the Basketball Hoop! The Basketball Set provides hours of fun for the children and creates a competitive atmosphere. Once your children have the Basketball Set attached to their Vuly trampoline, you won't be seeing them lazing around in front of the television or computer for the rest of the holidays. Instead they will be on the trampoline with their new favourite accessory! The Basketball Set attaches to one of the Vuly trampoline net poles with screws and bolts, and then there is an extra support pole that clamps onto the net pole for extra sturdiness and support. Here at Vuly, we can assure you that your children will have the most fun slam dunking, passing to each other and shooting for goal during these school holidays. Instead of the television getting all the attention, it will now be the trampoline Basketball Set! So don't waste time, hurry in to get your children active and off the couch by purchasing the newest and latest trampoline basketball set from Vuly Trampolines!